Comfortable accommodation for 5/6, located in the village of Nethy Bridge. Garden and parking, excellent base for outdoor activities, ideal for ski weekends. 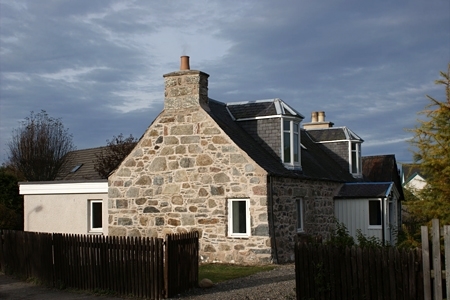 Bynack is a traditional stone cottage, recently renovated. It is situated on the outskirts of the village of Nethy Bridge (population 500) which lies within the Cairngorms National Park. It is perfectly located for those who enjoy outdoor activities. There are also many places of interest in the area to visit. Riverside and woodland walks and many cycle routes can be enjoyed from the door of the cottage. You will probably have lots of birds, red squirrels and maybe some deer for company! In the village, there is a grocer’s shop, a butcher’s shop, two hotels and a 9-hole golf course. As a family, we enjoy staying at Bynack and we hope that you will too! The cottage provides comfortable and attractive accommodation for up to six people. On the ground floor, there is a sitting room, dining room, kitchen and utility room, a small double bedroom and a shower-room. Upstairs there is a double bedroom, a twin room and bathroom. The dining room has a wood-burning stove and is adjacent to the new kitchen which is well equipped with modern appliances. The sitting room is comfortably furnished and, on winter evenings, visitors can relax in front of a woodburning stove. In addition to the two stoves, heating is provided by way of night storage heaters and convectors. The whole cottage is double glazed. There is a garden and parking. • Weekly bookings are from Saturday to Saturday. • Weekend or short breaks are offered from November to March. • Included in rent - electricity, supply of wood, towels and bed-linen. Please look at our website for full details, photos of the cottage and surrounding area, information on activities and places to visit, term and conditions of let, etc.